I visit Taranaki often these days, but rarely have lengthy amounts of time between commitments to devote to lengthy tramping efforts. I’m gradually working on visiting the different sides of Egmont National Park between other commitments, though. Between Christmas and New Year of 2014, I manage to visit another small section of the park where I’ve not previously managed to see. This time I’ll be generally around the western side. The plan? To be dropped off at the end of Ihaia Road and hop up towards Waiaua Gorge Hut for a night, then make my way clockwise around the western side ending at Holly Hut for a second night, before finally sliding out via North Egmont and being collected. Being all on fairly highly used tracks it’s not a complicated navigation route, unless you count repeated climbing up ladders and down ladders on typical Egmont sidling tracks to be complicated. My main concern is the potential rain, and a possibility of being blocked by side creeks, or (most annoying case) trapped between them. The forecast suggests a big drop of rain today (Monday), followed by a Tuesday without much happening, probably meaning the typical murky overcast sometimes-light-rain type of weather, and then a Wednesday with more rain and high winds starting to kick in. Also, the predictions have been changing lots over the last few days, which is often a sign that meteorologists aren’t very confident about what a system’s going to do, exactly where it’ll go and when it’ll go there. I’m arranging things so that the most uncertain and lengthiest part of the trip, with multiple big side creeks, will be on Tuesday. Hopefully that’ll work out. 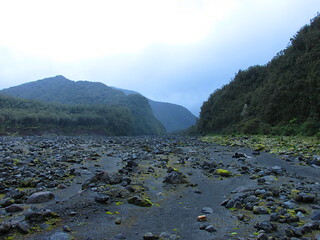 Location: Egmont National Park, Ihaia Road to North Egmont Visitor Centre. 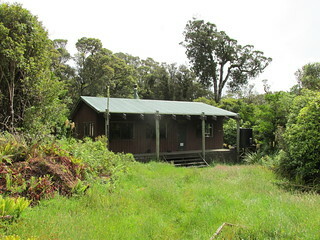 Huts visited: Waiaua Gorge Hut (1 night), Kahui Hut (0 nights), Holly Hut (1 night). Route: Up from Ihaia Road to Waiaua Gorge Hut for the night. 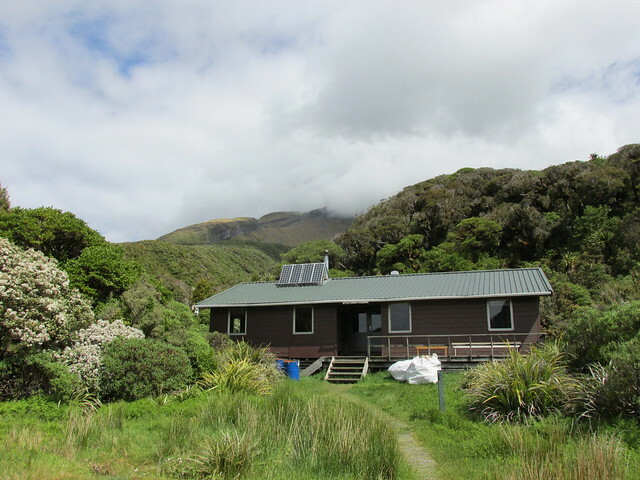 Then clockwise around Eggie, via Kahui Hut, ending at Holly Hut, then out via North Egmont. For logistic reasons we leave New Plymouth much earlier than I’d planned. Before lunch. The end of Ihaia Road is not much, but a couple of other cars are still crunched up against the grass-covered ditch. From here it’s a short walk over farm land, along a marked fence-line, then a surprisingly gentle walk up the 240 or so vertical metres towards Waiaua Gorge Hut, named after the nearby Waiaua Gorge and River. 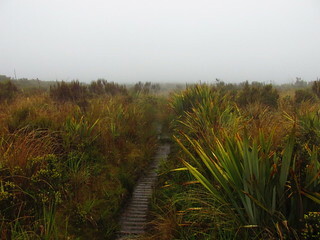 Nearer to the top, the track falls into the bed of the Oaonui Stream, which is dry at ground level, the recommended route being marked by large orange triangles on tall poles. 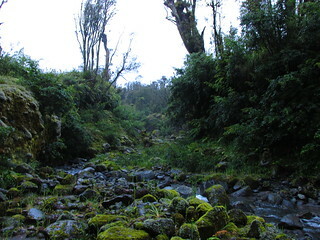 Soon after arrival at the Oaonui Stream, noisy thunder rattles behind me. 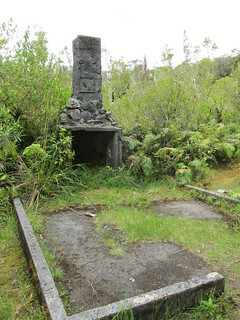 Not wishing to be caught in an electrical storm I hop to it, reaching and rapidly passing a sign marking the first major track junction, as well as the concrete foundations and fireplace for an old hut, of which I don’t know the story. I should be back here again tomorrow, but for tonight I’m aiming for Waiaua Gorge Hut. the 20 metre vertical drop wasn’t enough! I follow the marked track for some distance through the trees, before it drops into the upper reaches of the Waiaua River (okay to cross). 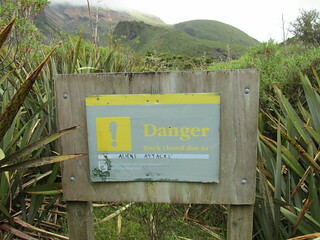 A short ladder drops down a short vertical face, right next to a “track closed” sign that warns visitors not to follow an obvious ground-trail straight off a high cliff which overlooks the Waiaua River. I have an old map with me, which shows a more direct route than what I’ve just walked, and I guess this is the site of one end of an old bridge that no longer exists. Waiaua Gorge Hut is occupied by one chap as I arrive. He waves hello, I happily acknowledge, and greetings aside I offer my recent printout of the weather forecast from this morning. More thunder rumbles, and I’m glad to have reached where I am before a total deluge arrives. I’m soon offered a cup of tea out of the hut kettle, boiled from the hut stove, and I gratefully accept. He’s arrived early, apparently walking the around-the-mountain circuit in what seems like a very slow rate of one hut a day, which leaves much time for reading and relaxing. Apparently a group of daywalkers has come up from somewhere, aiming for Brames Falls, which is a noted waterfall further around in the direction of Lake Dive. I think they’re about to get wet. I sit on the balcony as the rain finally sets in. It’s vintage Taranaki rain, a total downward deluge, and the underneath the balcony of back-country hut is a smug place to be. Sure enough, within ten minutes or so, four men roll up from the direction of the falls, and not very dry at all. Apparently this wasn’t in the forecast, though it must have been a different forecast from the one I obtained before leaving. I bet now would be a brilliant time to be watching Brames Falls, if it weren’t for the downpour. We have a short natter as for some reason they’ve decided to hang around the hut for longer than would normally be expected, and then I leave them to it as I pull out my ebook reader and try to commence reading. I’m told this hut has a brilliant scenic mountain view, but there’s not much to see right now. Part of the conundrum is that logistics resulted in me leaving much earlier than I expected, so my plan of hopping up the hill and reaching here late in the day became one of reaching here in the morning, and suddenly I’ve about half a day to burn and nothing to burn it with. 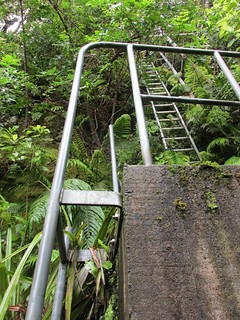 Anyway, the rain’s lifting off and I figure it’d be worth going to see the nearby ladder which drops into the Waiaua River, in the direction of Brames Falls. 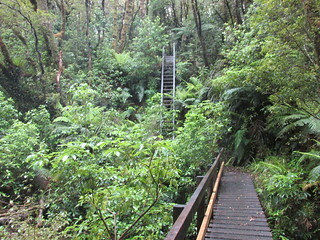 Despite being one of what must be tens or hundreds of ladders that DOC’s maintaining around Egmont National Park, because ladders and boardwalks seem to be a favourite of DOC here, this ladder has the distinction of being marked on the map. It turns out to be even closer than I thought, barely around the corner in fact. By Egmont National Park standards it could be one of the larger ladders in the asset register, but there’s not much special about it and I don’t understand why LINZ decides to mark it without marking every other ladder around the park. A couple of others turn up before dark. At about 3’ish we meet a guy who’s walked around from Holly Hut, aiming to stay here tonight, and a woman passes through from Lake Dive, deciding to continue and aim for Kahui. It’ll be a fairly empty evening at Waiaua Gorge Hut tonight, just the three of us. I cook my food, and slink around with my ebook. 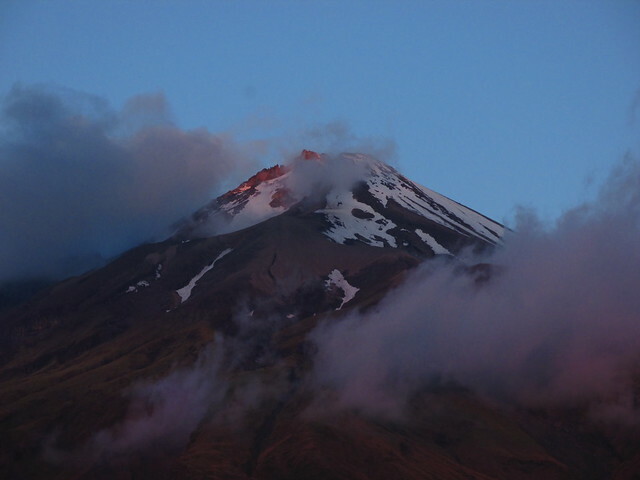 Towards the evening, most of the clouds clear and there’s a dusky vision of Mount Taranaki. Day 2 is my least certain day. DOC labels it as a 9 hour walk, and I expect to be faster than that, but I’ve often found maps of Egmont National Park to show tracks and routes as relatively gentle when they actually frequently undulate up and down into and out of deep creeks, albeit not deep enough to register on the contours, and without having done it I don’t want to try and guess just how much quicker I’d be. I’m keen to get away early, to allow plenty of correction time if anything doesn’t work out. I’ve had enough sitting around in a hut. After a reasonable sleep and a speedy breakfast and re-packing, I’m away and walking at about 7.45am. On a heavily overcast, humid but still morning, I backtrack last night’s approach across the Waiaua River to the track junction, then stick to the around-the-mountain route instead of back to the road. The junction is alongside the Oaonui Stream, which looks big on the map and which has a large river bed, but it must flow mostly underground around here because the river bed remains largely dry, despite recent rain. 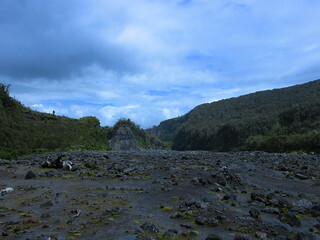 The main Eggie track which sidles clockwise from Waiaua Gorge Hut is a standard Eggie sidling track. It tries to stick to the same contour, but repeatedly crosses streams and creeks coming down from the summit, most too small to be present on a map, and all of which cut a deep gouge underneath the contour. DOC’s strategy for a workable track around these is a combination of small but often high bridges, track redirections deeply into a creek for crossing before climbing out of it, or ladders! Ladders everywhere. 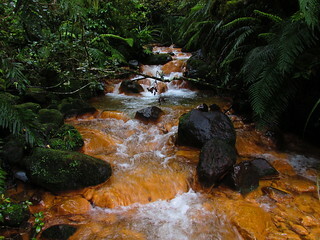 There are also occasional unbridged wider catchments, like the Okahu Stream. This continues until the junction with the Kahui Track that climbs up to Kahui Hut, across and back down slightly further along. It’s 9.15am. Amusingly, the signposted time for climbing 200 metres to Kahui Hut, sidling along the top and descending 200 metres back to the lower track, is identical to the signposted time for simply following the lower track in what, at a small scale, looks to be a much more direct fashion. To me this is a sure sign that the lower track is just a continuance of the hideous up and down and across pattern. 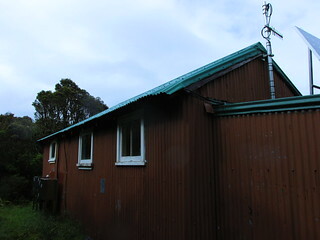 It just affirms that I’m better off heading uphill via Kahui Hut, which I wanted to do anyway. Despite the climb, the Kahui Track is a welcome respite from all that sidling. 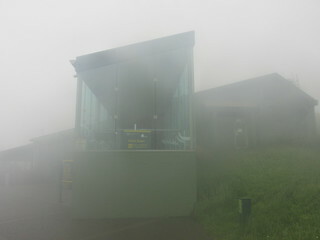 Time passes quickly, and at 10am, after 45 minutes of casual climbing, I’m at Kahui Hut. Kahui Hut was larger than I expected. I’d seen it listed as 6 bunks and assumed it was a basic Forest Service box, but it’s actually a bunk room with a separate living area, and a decent verandah. Besides recreational visits for the sake of it, I guess one of its main reasons for being is as a climbing base. Leading up the mountain from here is a summit approach from the western side, and as I leave to continue my clockwise venture, it’s easy to spot the gap in the trees where most climbers probably diverge for this route. This time I’m just going to follow the obvious, well benched track. It’s a great track that winds around the fringes of the bush-line for about a kilometre, prior to abruptly dropping back to the lower track. LOOK OUT! DON’T GO THIS WAY! There used to be a relatively direct high route to Holly Hut from up here, known as the Pyramid Route. It’s still shown on older maps, including one of the two maps I’d brought with me. My understanding, without checking it out, is that the route has since become very dangerous or non-existent after some major land-slides around the top of Pyramid Stream, and that’s some instability that’s still continuing in relatively recent times . To celebrate this event, DOC has placed a “closed” sign at the point where the route would previously have continued from, although the sign has now become overgrown. Anyway, I take the turn and follow the main route back to the lower track, briefly stopping to chat with the first three people I’ve seen outside today, up from the road for a day walk and who it turns out know my in-laws very well through orienteering circles. I’m back on the main lower track at about 11am, and soon meet another group of three who left Holly Hut this morning. By 11.30am, after a couple more crossings (of which the Maero Stream has the novelty of a chain instead of a ladder) I’m descending the steepish drop into Stony River, one of the major catchments that leaves Mount Taranaki. From here, there’s a big turn to the east following the riverbed, now being more north of the mountain than west. The bed of the Stony River is massive, certainly compared with what’s flowing above ground some way to the far side. That’s still a decent amount of water, but over the millennia it’s carved out a wide space. Noting the time (around 11.45am) I wander across, find a nice rock, and eat some lunch. Despite the overcastiness of the sky, it’s surprisingly hot. The most significant crossings of the day are still ahead, being several side-streams flowing into the Stony River, but I’m no longer highly concerned given what I’ve seen and knowing that there’s been little rain today. A route is marked in the river-bed with large orange triangles, and at midday I set off again. The first significant stream is Pyramid, which is straightforward enough to ford after some surveying up and down. A track then leads out of the Stony’s riverbed and into the forest, sidling above its true right. Most of it looks good although I find it slightly confusing to follow where it drops through the Hoson Stream (I think), on its way back to the Stony. After a while, the track comes near to the bluffs over the main river’s edge, offering a good look at the channel of fast-moving water below. Several of the side creeks along here seem to be depositing a deep reddish brown hue onto all the rocks they flow over, which caused me to wonder what’s happening geologically. Shortly before 1pm, I’m at Peters Stream, which seems to be another significant crossing, and which should also be the last. It’s easy with some brief thought, but I’m still glad I’m not trying to do this during some of the heavy rain I’ve seen predicted to come through tomorrow. And finally, I find myself climbing out of the catchment, the day feels complete, and I’m not longer concerned. Bells Falls is straight ahead, Holly Hut is around the corner, and it’s barely the middle of the day. Time for a visit to Bells Falls. blob of volcanic lava behind it. I have already visited Bells Falls a few years ago, and it hasn’t changed much. Waterfall. Great. Looks cool. Later when I’m asked what it’s like, all I can respond with is that it’s a heap of water falling over a cliff, because that’s really what a waterfall is. 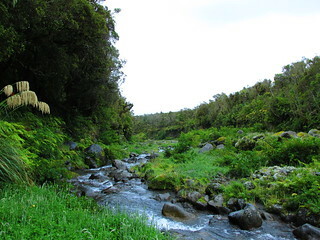 This is also the main tributary of the Stony River, though, and one of the neatest aspects of it is that it straight out of the Ahukawakawa Swamp, better called a wetland, which catches and channels and cleans out a substantial amount of rainfall through a basin between Mount Taranaki and the Pouakai Range. The officially marked side-track stops some distance back, but it’s possible to sidle the true left of the bank and get much closer, and ground trails indicate that many people do this. It’s still a waterfall. I backtrack to the junction, and aim for Holly Hut. 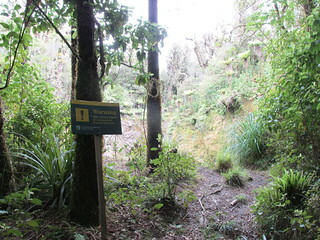 Before reaching it, I pass yet another “track closed” sign, most likely being for the other end of the high level Pyramid route from the Kahui Track, that’s no longer navigable. It seems I was wrong in thinking that geologic activity resulted in this. According to the sign, it’s actually due to Alien Attacks. 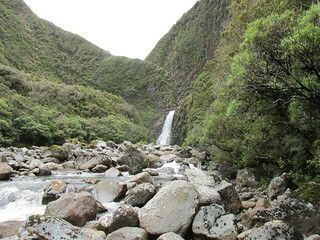 I walk up to Holly Hut at 2pm, just over 6 hours after leaving Waiaua Gorge and so much quicker than the signposted time. There are four occupants inside. Holly Hut is large, and the four of them have spread between all three bunk rooms, but in a friendly gesture I’m immediately offered a room to myself, at least until anyone else arrives. Of the other occupants are a young Scottish couple, based in Auckland and intending tomorrow to return the way I’ve come from, and a man with his nephew, walking the Pouakai Circuit, taking their time in short legs. Tomorrow they’ll go just across the swamp to Pouakai Hut. Hopefully the Scottish couple don’t get rained on too heavily around the crossings. I think they’ll be okay if the heaviest rain holds off until late in the day. It’s been overcast all day today, consistent with my printed forecast of nothing-much happening. I sit on my lower bunk in the sunshine, which has a nifty view of the lower part of what I think is Carrington Ridge, and read my ebook because most of Carrington Ridge is in fact enveloped in cloud. As the afternoon rolls on, though, the clouds begin to lift. 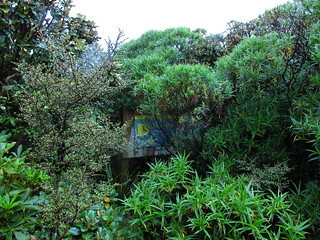 Unlike Waiaua Gorge Hut, Holly Hut isn’t angled well to have a direct view of the mountain, during those few times when it’s actually visible at all. Instead it’s necessary to stand a few metres in front of the hut and look back. And surely enough, there’s actually a peak poking through the clouds. I take some photographs, because there’s little else to do. 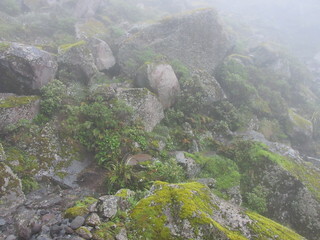 Part of a mountain, from near Holly Hut. 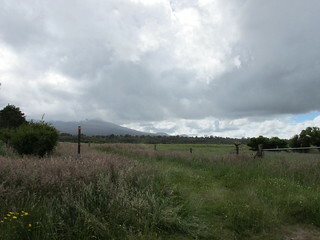 The Pouakai Range, from near Holly Hut. Holly Hut, from near Holly Hut. Evening arrives. I cook more food. I play with the incandescent light bulb that’s connected to Holly Hut’s solar powered lighting system, because it’s not working. I eat food. It doesn’t make a noise when I shake it, though, suggesting it hasn’t blown. Food’s tasty. Then the sky darkens, as happens at night, and the light bulb still doesn’t work so I revert to the torch as I would have done anyway. Exciting times, and I arrive at Wednesday, being day three. My underlying concern with Wednesday is that the forecast has wind picking up reasonably strongly. The forecast from a couple of days back only had it gusting to about 60 km/h as a northerly, which I know I can stand in under regular circumstances, but I’m also not well versed on how that type of wind will gust around the northern side of Egmont. It’s not a high concern, though. 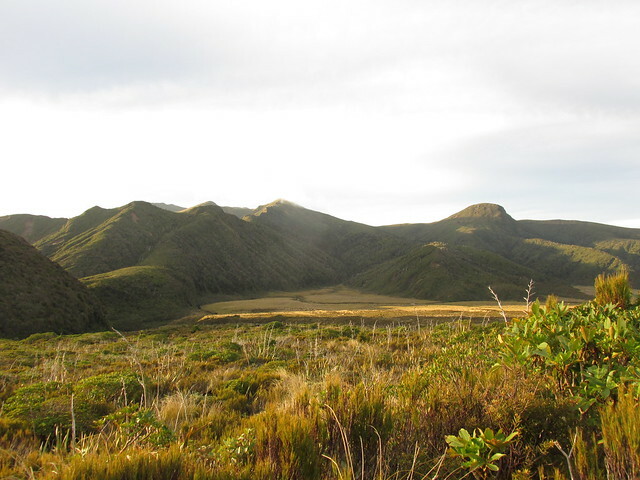 Wednesday morning remains calm at Holly Hut, and my preferred backup plan (aside from returning if it seriously came to that) would be to hop down the Kokowai Track, which aims straight for the trees rather than sidling around the mountain. The morning’s overcast again and fairly dreary. With time to burn, and after helping out with some hut clean-up, I don’t leave until 9am and also figure that I might go to hang out in the swamp for a while. I like wetlands. I try to walk very slowly, and yet it’s only 9.20am by the time I reach the other side, so that didn’t work very well, and I’m back on the around-the-mountain track aiming for North Egmont by about 9.50am. 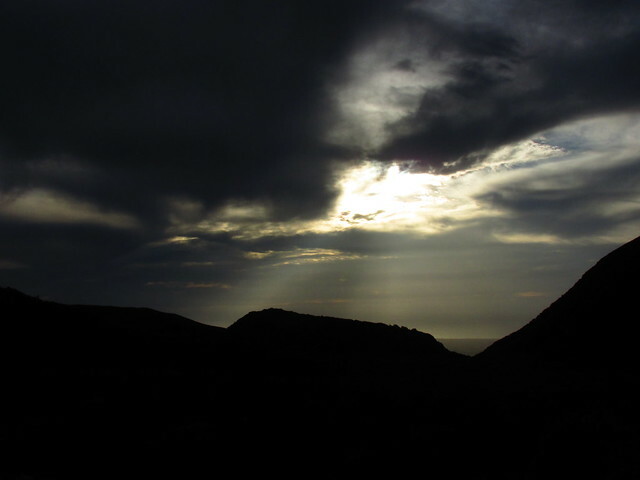 The rain begins, light at first. 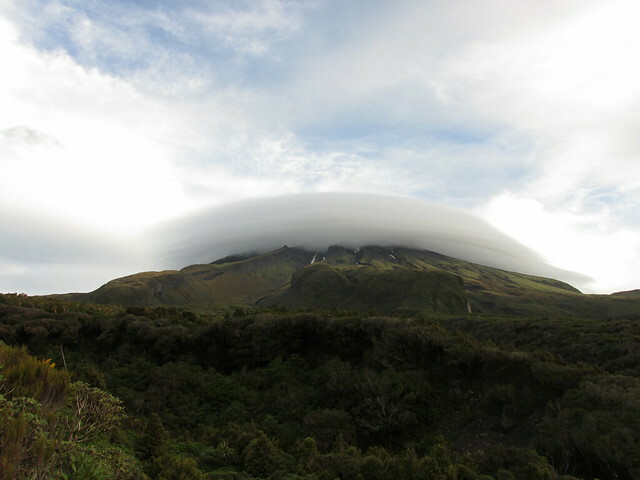 Welcome to Mount Taranaki. I’ve walked this section multiple times in the past, and and by now I’m starting to think about just getting to the end. It’s not a very eventful walk, apart from meeting one guy on his way to Holly from North Egmont. The wind also holds off. Of this section, though, I’m reminded of just how many steep river gullies and slips there are. Maps would have you believe that Boomerang Slip is the only one of any significance, but especially beyond the Kokowai Track junction (which I passed at about 10.40am), the main route to North Egmont navigates over them repeatedly and requires intermittent clambering up and over large, flat rocks which are mostly stable. Eventually reaching some very highly maintained tracks, which must be close to the visitor centre, I nearly trip over and roll my ankle before fortunately managing to save myself. The maze of carparks and connecting footpaths in that place is confusing enough, but it’s about 12.30pm when I finally arrive at the visitor’s centre. Good timing, too, because not long after the rain and wind arrive and really start to hammer this building, right on cue with what had been an uncertain forecast before I left. It also wasn’t a coincidence that I arranged to end things here. As highly managed as it is, sometimes it’s nice to just be able to sit down and relax in a warm, sheltered building, especially when that building’s equipped with a cafe that makes a massive bowl of nachos covered in cheese and bacon. 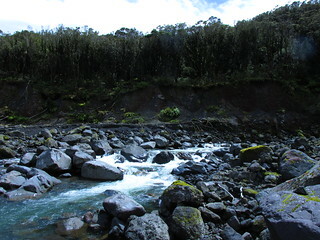 5 Comments To "Trip: Waiaua Gorge to North Egmont"
Often in Taranaki, eh? If you have time and are travelling through Whanganui, feel free to drop on for a cuppa / etc. Nice summer trip. Spent a bit of time there over the years but have only done day walks. A beautiful maunga. Love that photo of the lenticular cloud. Thanks, Robb. Yes it was very enjoyable. Thank you. And they certainly do. Thanks for pointing that out (and fixed).